The movie that Columbia Pictures/Sony Pictures present us this summer is an Animated and fantasy film. The director Raja Gosnell presents a family & comedy movie. The film begins with an explanation of Smurfette's origins. This movie started in The Smurf’s Town where all the smurfs are planning and organize a surprise Smurfette’s Birthday party, in this little village every house looks like a mushroom. Katy Perry plays the role as Smurfette; She is so excited to celebrate her birthday, but every single smurf make her believe is just another normal day, like nothing special is going to happen. Gargamel’s role is played by Hank Azaria, the evil wizard Gargamel creates a couple of mischievous Smurfs These creatures called the Naughties This two creates looks like smurfs;but they are a grey-skinned Naughty designed to wreak havoc amongst the Smurfs, There are one girl and one boy, but they aren’t blue; they need the magic formula to make them look blue just like the real smurfs. Gargamel send the naughty girl to the Smurf’s town to take advantage of Smurfette's insecurity and kidnaps her in the hopes that he can make his own Smurfs, he is hoping toget one of them to revel him the secret of the smurfs; Gargamel needs and hopes will let him harness the all-powerful, magical Smurf-essence and prepare the magical formula himself; so he can turn the 2 naughties smurfs and real smurfs .The Naughty Girl Smurf gets transported in a magical hole in the river’s water that end in the smurf’s town. At the same time Smurfette is getting sad because she is gretting some of the smurf’s friend but no one tell her anything about her birthday and she really thinks and believes that everybody forget her birthday. Jonathan Winter plays the role of Papa Smurf, Papa Smurf is making a special present for her. Smurfette is walking to the side of the river, she feels really sad and her feelings are hurting because no one tell her anything regarding her birthday. Suddenly the hole in the river drop the Naughty Girl Smurf that Gargamel created. She pretended to be friendly and need help to get the attention of Smurfette. Smurfette try to help her but both are send them back to Gargamel house, some of the Smurfs heard when Smurfette is screaming for help, all of them run to help her but they are gone. Papa Smurf select a few smurfs to go and find Smurfette, After all, the film's big take-away message is at least partially noble: "love is [not] conditional." Any parent that goes to see "The Smurfs 2" is essentially teaching their children that lesson by example. Adults suffer so that their know-nothing spawn can enjoy all-too-brief happiness. Papa Smurf and a few other Smurfs travel in the magic holle to go and rescue Smurfette. The Papa Smurf and a few smurfs find out that Gargamel keeps Smurfette. Meanwhile, while Patrick (Harris) tries to help reunite the Smurfs, he also has to deal with his own identity crisis: stepfather Victor (Gleeson) wants to be part of Patrick's family, but Patrick doesn't relish his unsolicited affection. The fact that Smurfette is, in fact, different from the other Smurfs is a mixed blessing. On the one hand, Smurfette is only distinct in that she's so insecure and helpless that she's usually on the verge of tears. On the other, she's simply not as annoying as the other Smurfs are. Vanity, a more-than-effete, self-absorbed Smurf who is obsessed with his reflection, is constantly joking about being "gorgeous," obsessed with musicals, in love with his own "gluts." And Grouchy's negativity is so trying that he briefly tries to re-invent himself as Positive Smurf, though he inevitably gives up on that nobler aspiration. There is ultimately no joke that the film's Smurfs won't despairingly beat into the ground. The film's human actors aren't much better. Like the film's voice actors, Harris, Gleeson, and Azaria are never given a chance to prove that they're played by people with a sense of comic timing. Azaria fares the best of this bunch, and as in "The Smurfs," he takes every chance he gets to ham it up. But with several subplots crowding his character out, Azaria just doesn't have enough space to be funny. 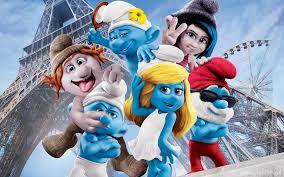 "The Smurfs 2" didn't need to be thoughtful, or even raucously funny. But the film's various parts could have been played by anybody. A scene where Harris handily imitates Gargamel suggests that you could easily swap all three human male leads' roles without greatly improving or diminishing the film's quality. And you can barely tell that Jayma Mays's Grace, Patrick's wife, is in the film save for a juice-less scene where she desperately apes Audrey Hepburn. There's so much dead air in "The Smurfs 2" that you may turn to your child mid-film, and ask, "How did it come to this," or, "When is your Oedipal phase kicking in, exactly?" Then again, you can wait years, even whole decades to light that particular emotional powderkeg. Love may be unconditional, but seeing "The Smurfs 2" is a bargaining chip you can cash in whenever you want.